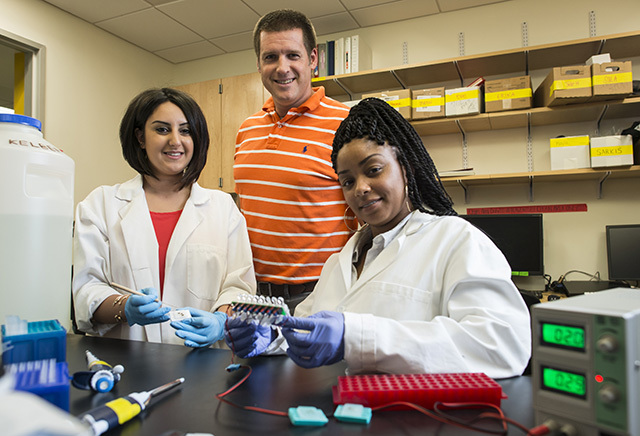 CSUN biology professor Jonathan Kelber, shown here with biology graduate student Yvess Adman (left) and biology graduate student Malachaia Hoover (right) was recently awarded a $1.46 million grant from the National Institutes of Health. Photo by David J. Hawkins. The National Institutes of Health has awarded California State University, Northridge biology professor Jonathan Kelber $1.46 million over the next four years to support his research group in their ongoing studies of the cancer “support wall” gene called PEAK1. His research has implications for future treatment diagnosis and treatment practices for breast and pancreatic cancer patients. The grant, a Research Project Grant (R01)-equivalent, designated SC1 (or Research Advancement Award) by the NIH, is one of the largest research grants awarded to a CSUN faculty member. Kelber said the grant, which could be renewed for an additional four years, will play a crucial role in expanding his research program toward combating both early and late stage breast and pancreatic cancers – improving both diagnostic and treatment practices for patients. Kelber has spent years studying cancer metastasis and the role that PEAK1 plays in this process. Metastasis is when cancer cells move from their original source to other parts of the body through the blood stream, and form malignant tumors elsewhere. Kelber’s group at CSUN was the first to show that the PEAK1 gene is essential at the earliest stages of aggressive breast cancer metastasis. That study was published in 2015 in the Public Library of Science (PLoS) One Journal. He has done similar research in the past on the role PEAK1 plays in pancreatic cancer. The grant has enabled Kelber to hire a postdoctoral scholar to assist with the project, as well as a technician to help oversee his laboratory’s operations. They will join the four CSUN undergraduate and six CSUN graduate students who are already working with Kelber on related projects. Kelber said the grant also will give him access to resources he might otherwise not be able to tap into. The grant also means that Kelber doesn’t have to spend as much time as he has in the past writing for grants to support his research — he can now turn his attention toward mentoring his team and rapidly reporting their findings.